Mark Wilson/GettyKristi Gilroy, right, hugs a young woman at a police checkpoint near Marjory Stoneman Douglas High School in Parkland, Florida. The Broward County Sheriff’s Office on Thursday released a timeline with internal radio dispatches and video-surveillance records that reveals how deputies responded to last month’s shooting at a high school in Florida. The timeline is especially damning for the armed deputy assigned to the school, who never confronted the gunman during the shooting. The deputy remained outside the building and even directed other officers to stay 500 feet away from the scene, the dispatches show. The timeline also shows that 11 minutes passed between when the gunfire broke out and when officers from a neighbouring police department entered the school. The armed school resource officer who failed to confront the gunman during the shooting at a Florida high school last month that left 17 people dead also warned other first responders to stay away from the scene as the massacre was unfolding, internal radio dispatches from the Broward County Sheriff’s Office show. The deputy, Scot Peterson, resigned roughly a week after the shooting, after an investigation by the sheriff’s office found that he did “nothing” to stop the gunman and stayed outside the building for several minutes after the gunfire broke out. Peterson’s attorney has told news outlets it’s “untrue” that Peterson failed to follow protocol, saying Peterson believed the gunfire was outdoors and responded accordingly. But a timeline with radio dispatches and video-surveillance records made public by the sheriff’s office on Thursday indicate that Peterson knew the shots were coming from inside the building. “Be advised we have possible – could be firecrackers. I think we have shots fired, possible shots fired, 1200 building,” Peterson radioed at 2:23 p.m., roughly two minutes after the gunfire broke out, according to the records. “Stay at least 500 feet away at this point,” Peterson radioed at 2:28 p.m., soon after the gunman stopped firing and ditched his weapon, the timeline shows. “Stay away from 12 and 1300 building,” a dispatcher repeated in a warning to other officers. Four officers from the Coral Springs Police Department and two Broward deputies entered the building 11 minutes after the shooting began, the timeline shows. At 2:19 p.m., the suspect in the shooting, Nikolas Cruz, arrived at Marjory Stoneman Douglas High School via an Uber. The gunman entered Building 12 at 2:21 p.m. and opened fire within 15 seconds. At that point, Peterson was in a different building on the school’s campus. The school’s fire alarm went off at 2:22 p.m., prompting students to begin evacuating. This is also when the first 911 call went out. Peterson then arrived at the southeast corner of Building 12, where he remained “for the duration of the incident,” according to video-surveillance records cited in the timeline. The gunfire stopped at 2:27 p.m. The gunman ditched his weapon in the third-floor stairwell and left the building. Five seconds later, Peterson radioed again to “stay at least 500 feet away at this point.” A dispatcher echoed the command. At 2:32 p.m., four Coral Springs officers and two Broward sheriff’s deputies entered the building for the first time. An officer with the Coconut Creek Police Department arrested Cruz at 3:40 p.m. in a nearby neighbourhood. 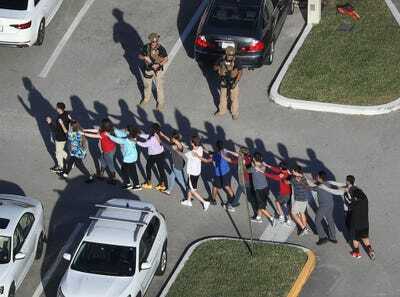 Joe Raedle/Getty ImagesPolice escorting students out of the high school. The radio dispatches support much of what the Broward County Sheriff’s Office has said about Peterson’s response during the shooting. 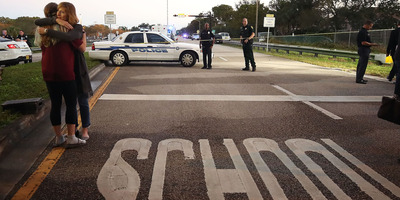 In the US, police officers are generally directed to confront active shooters immediately rather than wait for SWAT teams to arrive – a practice adopted widely after the 1999 shooting at Columbine High School in Colorado. 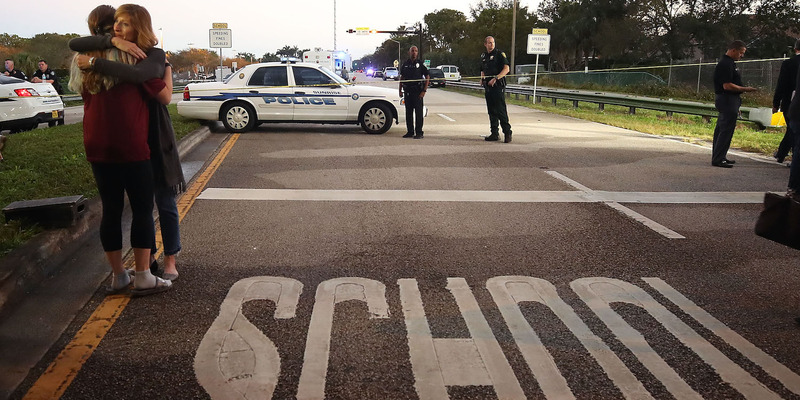 During that shooting, officers hung back and set up a perimeter around the school instead of entering and confronting the two shooters, who killed 13 people and injured 21 in under an hour before turning their guns on themselves. It took police more than three hours to find them.